March is National Nutrition Month, a time to kick start your goals for getting fit, feeling great, and looking good. And this year the National Nutrition Month campaign honors MyPlate, the latest set of healthy eating guidelines developed by the US government. Every five years, a panel of nutrition scientists and experts gets together to review the current science, our eating behavior, and diet-related health problems in order to come up with a plan to promote a healthy diet for Americans. And it’s no surprise that we have a long way to go as a nation—we’re suffering from high levels of obesity and diet-related chronic diseases, such as diabetes and heart disease. This is particularly clear when we consider the impact of obesity among children. Nearly one-third of children and teens are obese or overweight, putting them at risk for a laundry list of health and social problems in their future. Obese kids are on track to live a shorter life riddled with diseases such as type 2 diabetes, face lower employment and income levels, and receive higher health care bills. Enter MyPlate—a simple image of what your dinner plate should look like. And the first thing you’ll probably notice about MyPlate is that your plate should be filled mostly with plant foods, such as vegetables, fruits, whole grains, lentils and beans. The morale of the story: meat no longer has to be at the center of your plate; you’re better off focusing on plant foods, which are naturally rich in all of the “good” stuff, like vitamins, minerals, fiber, and antioxidants, and naturally low in all of the “bad” stuff, like saturated fat, dietary cholesterol, and sodium. Change your mindset. Don’t think of the animal protein first when you’re planning your menu. 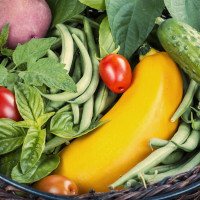 Instead, think of which gorgeous fresh vegetables and fruits are in season and which delicious whole grains and legumes (beans, lentils, and dried peas) are available and pique your interest. Use meat as a seasoning. That’s how most healthy, traditional diets are planned; they turn a single portion of chicken or beef into a delicious, plant-based meal for the whole family. Case in point: a lovely vegetable stir-fry with shrimp or chicken served with brown rice. Put beans and lentils on the menu. Who needs meat when you can feast on savory lentils, fava beans, or black-eyed peas? Combine them with veggies and whole grains and you’ve got a low-cost, delicious, nutritious meal you can feel good about. Double—or triple—up on the veggies. One little side serving of veggies on your plate is just not going to cut it. Try at least two different types of vegetables for dinner—perhaps a vegetable soup or salad and a cooked vegetable or two. And remember, frozen or canned vegetables (without added salt) count towards your veggie requirement. Dive into whole grains. Include a serving of cooked ancient grains—quinoa, wheat berries, Kamut, barley, bulgur, or brown rice—on your plate. The easiest way to prepare them is to put the grains in a rice cooker, add the required amount of water (use vegetable broth for more flavor), and push the start button. Dine on fruit for dessert. Kill two birds with one stone—eat delicious, naturally sweet fruit (fresh, frozen, or canned without sugar) as your after meal treat every day. « Twenty Plus Fitness Tips to Get Moving Everyday!